English football is admired across the world. The Premier League is a global brand, drawing millions of viewers to televised games in all four corners of the globe. Even the Championship and Football League has fans overseas – on a recent trip to New York, a bar close to my hotel proudly advertised they were opening early to show “the big game” between Wolves Wanderers (sic) and Swindon Town. Whilst the professional clubs are busy sticking their logo on everything that doesn’t move, PR men talk about their global audiences, eyeballs, Klout scores and official partnership agreements, Non-League football is looking at days gone-by to resurrect the magic of a match day. Non-League clubs are wise-enough to realise they cannot compete with their biggest, richer neighbours so they have to be clever. And in a few cases they are proving to be top of the class. 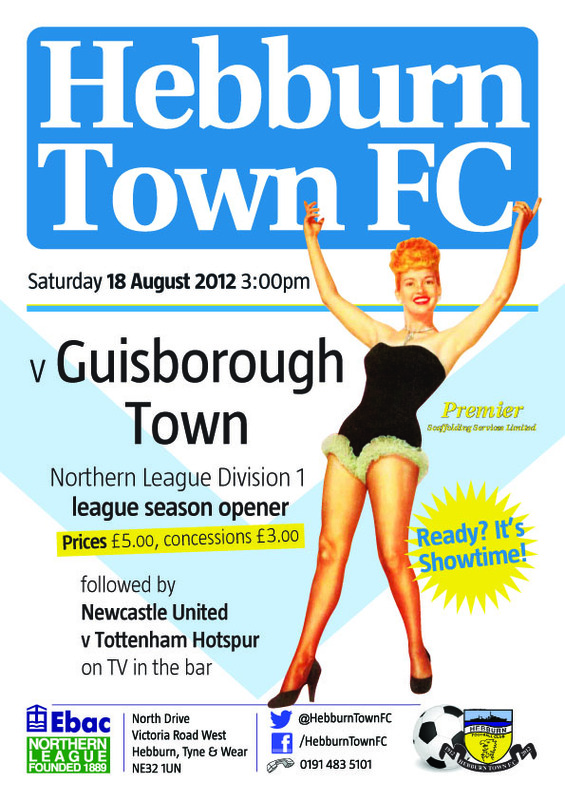 Welcome to the world of the Match Day Poster. I remember when I was a young Hammer and I used to save my pocket money to buy a pack of Match Posters once or twice a season. For just £1 I got a random selection of five or six posters from previous games that would take pride of place on my bedroom wall, in between the Toyah picture and one of Bananarama (come on, admit it even now you wouldn’t turn them down). 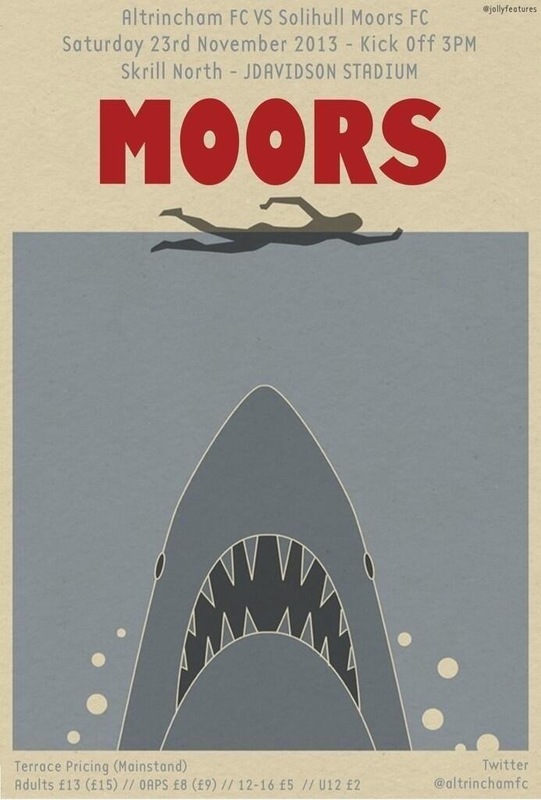 The posters were simple – a light blue paper with the match details in bold claret ink. Somehow they made me feel part of the club. As the times have moved on, clubs have slowly replaced tradition with commercially-fuelled rubbish. If something can be sponsored, it will. Why bother with a poster displaying forthcoming matches when you can use the space on your website to advertise your new Energy Drink partnership? As clubs have become less engaged with their fans, the creative brains are moving into the Non-League game to sate their creativity. 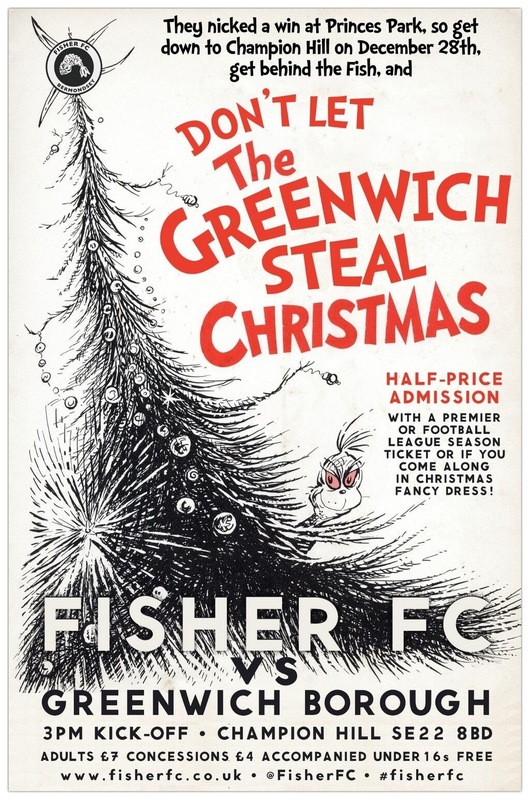 With a lack of volunteers, Non-League football is crying out for such creative ideas and the rise of the Match Poster is a phenoneom that cannot be stopped. At Lewes we have built a following of fans, not just for the club, but for the creative efforts of our design team who think up the off-the-wall ideas. Whilst our average attendances may rarely break the six hundred mark, the launch of the next match poster via Social Media will often get double that in terms of views. Whilst they may not result in additional people through the gate, it increases the interest in the club. And with this internet thing being a global network, new fans are popping up in all sorts of places. As a community club, Lewes have owners in over a dozen countries at the moment. We thought we were slashing a lonely path through the jungle of creativity, but we were wrong. In the past few months we have stood up and applauded the efforts of Altrincham, Fisher FC, Newport Pagnell and Jarrow Roofing BCA in creating magic, all the while cocking a thumb at our bigger neighbours who had ignored our existence for so long. But slowly they are sneaking back into the professional game. Imitation is the greatest form of flattery, and when Burnley FC copied our poster design (exactly) for their game against QPR we were initially miffed, but then saw that actually it was the ultimate honour that a club of their size and with so much resource would choose to adopt the work of a club 250 miles south and who get crowds of 20,000 less. But The Clarets are still in their minority. 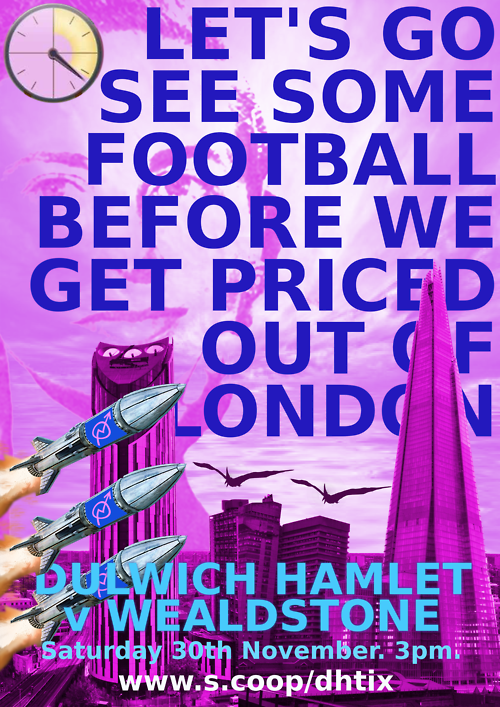 Whilst clubs like Altrincham, Dulwich Hamlet and Lewes continue to use the posters locally to promote their forthcoming games in shop windows, schools and billboards, professional clubs stick to their websites missing a major trick in a simple fan engagement way. With the cost of watching professional football rising each season there is a danger that a whole generation of potential fans could be priced out of the game. Non-League clubs who are creative enough will be the winners in the end. So hats off to the pioneers of the Non-League game – keep the good times rolling. 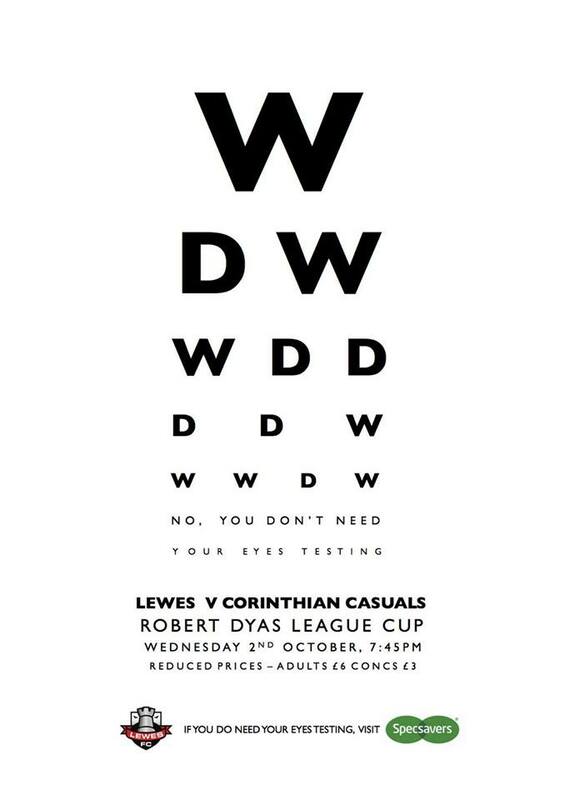 To see the full collection of Lewes match posters click here. An edited version of this article was published in April 2014 When Saturday Comes magazine. This entry was posted in Lewes FC, Non league football and tagged Altrincham, Dulwich Hamlet, Lewes, match posters, Non League football. Bookmark the permalink.